With kettles such a common feature in most kitchens, the phrase 'if it ain’t broke, don’t fix it' might come to mind, but a home hot water dispenser can be a surprisingly useful addition to the kitchen worktops in more ways than one. Why buy a hot water dispenser rather than a kettle? For some sufferers of chronic pain, or those with mobility issues, filling, carrying, lifting and pouring a kettle can prove difficult, an issue that hot water dispensers solve with their push-button controls and static vertical spouts. If you need a large volume of boiled water at once, for example when filling a pan for dinner, you might be better off with a kettle, but the other big bonus to buying a hot water dispenser more than makes up for it, and that’s the the speed at which you can have a perfectly boiled cup of water — in many cases, up to four times faster than a conventional kettle. And, as they only boil as much as they need at a time, they can prove much more energy efficient. While you can get water dispensers with generous capacities which are ideal for big households, there are also more compact models that won’t take up too much space on the counter. This slender water dispenser looks neat on most modern worktops, with its gloss black finish and stainless steel trim, but its performance earns it a place as our best value buy. The Hot Cup is easy to fill, the extra-large window on the water reservoir making it easy to keep an eye on levels, and the smooth continuous flow minimises splashing and the risk of burns, while the drip tray catches any excess for less mess. This water filtering dispenser is the best choice for tea lovers, with its variable temperature settings from 55 to 100 degrees making it easy to create the perfect cup of green tea without the bitterness that boiling brings, or a good old cup of builder’s. You can also set the exact amount to be dispensed in millilitres, so it’s ideal as a helping hand while cooking, too — overall, a sleek stainless steel dispenser that handles a range of tasks elegantly and precisely. If you live in a hard water area and are frequently put off by that tell-tale film on your cup of tea, this is the water dispenser for you. With its in-built Brita filter, it eliminates the need for a separate filter jug and kettle, saving expense and faff, and improving the taste of your brew. 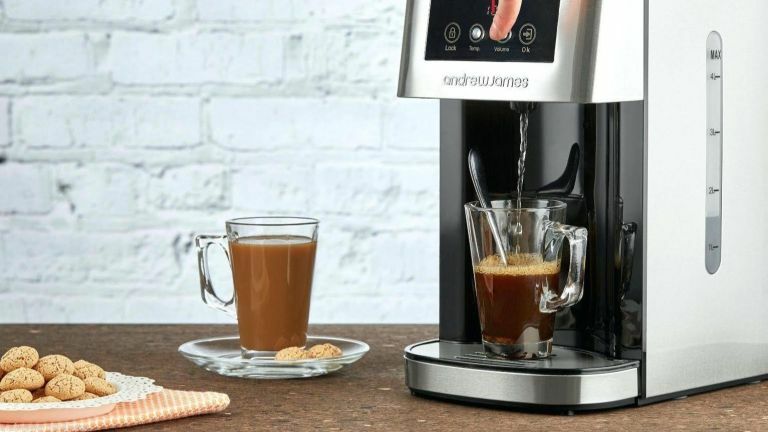 It lets you choose from nine different vessel sizes, or use the manual stop button if you prefer a more customised cup, but has no variable heat settings. Just like our previous pick, the Morphy Richards Redefine has an integrated Brita filter to keep your cuppa clear and tasting good, making it an ideal for buyers in hard water areas. It also has the added bonus of looking great on the worktop, with its nearly-matte finish and gently curved housing, but even if a stylish appliance is a must, its real value lies in its ability to make life easier. Users loved that you could choose for it to dispense a set amount, and disabled testers found it invaluable for its less strenuous operation. Looking to boil a lot of water quickly? There's none better. This sleek water dispenser heats incredibly quickly, getting up to temperature in mere seconds, and holds a considerable four litres in its reservoir, meaning that large French presses and hot water bottles can be filled at a moment's notice. Of course, the flip side of this is that it does take up quite a bit of room on the counter, but if you've got the space, reviewers said they wouldn't be without it, citing the easily manageable flow speed and great tasting tea as just some of the reasons why.